Game Goal: The application crashes frequently, especially on older devices. How to play: You can play alone, against the computer or take part in the championships challenging other players in the network. Graphics: Nice visuals, with 3D graphics become even more realistic game. Installation requirements: A minimum of 11M of free memory space and Android 2.3 or higher. Rating: The TOP 10 Most popular games in Pool Games category. Ranking: The TOP 5 Most downloaded games in Pool Games category. Lets you play individually against the computer or against other online players. It has four different difficulty levels. It offers various game modes including, Pool, Snooker, Billiards, Carrom and Crokinole. Lets user play individually against the computer or against other online players. Nice visuals, with 3D graphics. 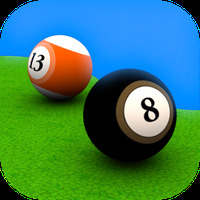 Do you like Pool Break Pro 3D Billiards? Match the colors to clear the pool and win! Challenge friends in a virtual game of pool!